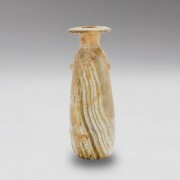 Datation : 2nd century A.D.
A beautiful, small glass flask that imitates the shape of a date. The vertical grooves recall in a very realistic way the wrinkles of the dried fruit. 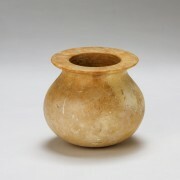 Vessels in the shape of dates are among the most famous and popular glass vases of the early Imperial period. 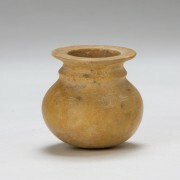 Most date flasks were blown in two part molds: the very realistic rendering of these vessels suggests that they were originally shaped around real dried dates. From the early Imperial period on, these small perfume vases were widely spread in all areas of the Empire, often far from their production centers which were certainly located in a coastal city of Syria-Palestine, perhaps in Phoenicia. 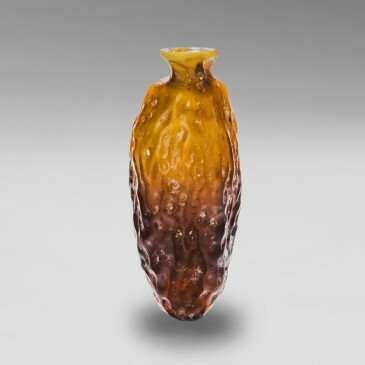 In ancient times, this region was prized not only for its mold-blown glass vases of the highest quality, but also for its particularly sweet and juicy dates. It is thus tempting to imagine that the glassmakers got inspired by the local fruit par excellence to create these small vessels that have been largely used to contain cosmetic or medicinal products. The vessel is complete and intact. The glass is of a beautiful golden brown color.